A while ago, I was at a coffee shop with my boss talking about important work things like paper clips, suits and Wayne Coyne’s gigantic hamster ball. ANYWAYS we must have come in close to closing time because the employees were cleaning up shop and cashing out. 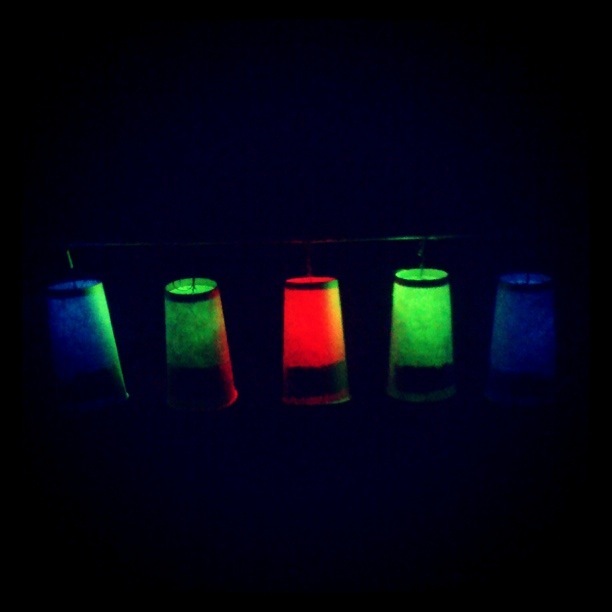 As you can see from the video, when a cup is hit, it lights up and plays a certain tone. If you watch closely, you can see that if two cups are hit at the same time, two tones will play. This also applies for more than 2 cups as well (you can play all five simultaneously). 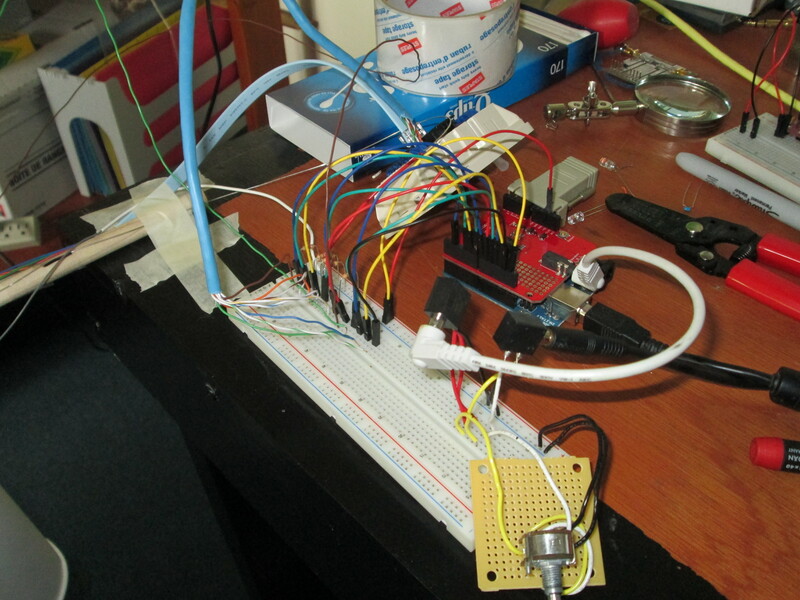 The tinfoil lining is connected to a 5 V line and bus and the ball is connected to an Arduino input. The ball acts as a simple switch. 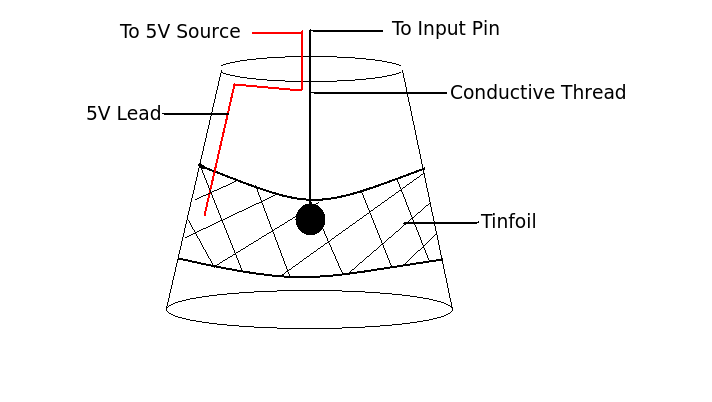 When the cup is hit, the ball swings and touches the tinfoil lining closing the switch and the input pin is brought HIGH. When the ball swings down, the switch is open and the input pin is brought LOW (with the help of a 4.7k pull down resistor). 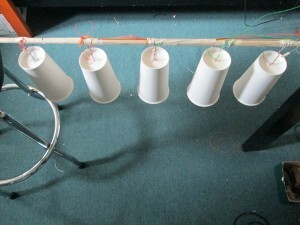 All cups are attached to a dowel rod. They are supported mainly by the 5 V lines which probably isn’t a great idea for support but so far it’s held up pretty well. The other lines twisted onto the 5 V line are the ground, input & output lines. The 5 V and Ground buses are wires stripped bare and running along the dowel rod. I definitely made sure to keep the two well separated. The 5 V and GND lines in each cup connect to their respective buses. The Arduino provides the voltage and ground. 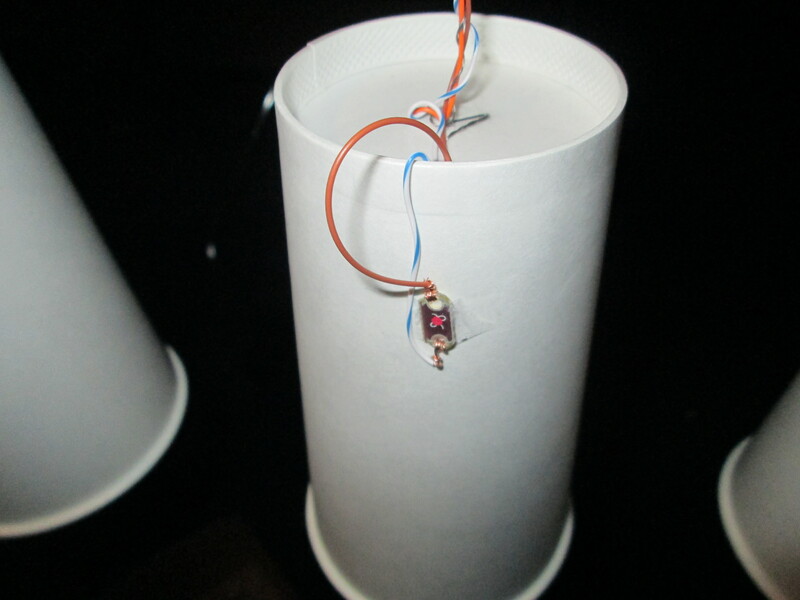 I’ve added a potentiometer there to act as a volume control for my speaker as tones are played. You can also see that I used cat5 cable to try to make the circuit more tidy. The coding wasn’t actually all that tough. The hardest part was to figure out how to play more than one note simultaneously. To achieve this, I set up a system where “blocks” of information are sent per time interval. 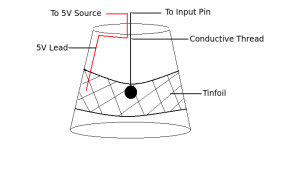 The microcontroller (uC) polls the cups continuously, checking to see if it on. An array stores info on whether or not a cup has been hit. This process repeats until a certain amount of time has passed – this is when the timer expires. When this happens, the program ships off the array to the tone generation function where the array is processed and tones played (and LEDs lit). index[ ] stores on/off information for tones. When no cups are hit, all the elements in the array are “0x80” or “stop” in MIDI talk. When a cup is hit, the corresponding element is changed to “0x90” or “play” in MIDI. light[ ] stores on/off information for the LEDs. This array is simple. 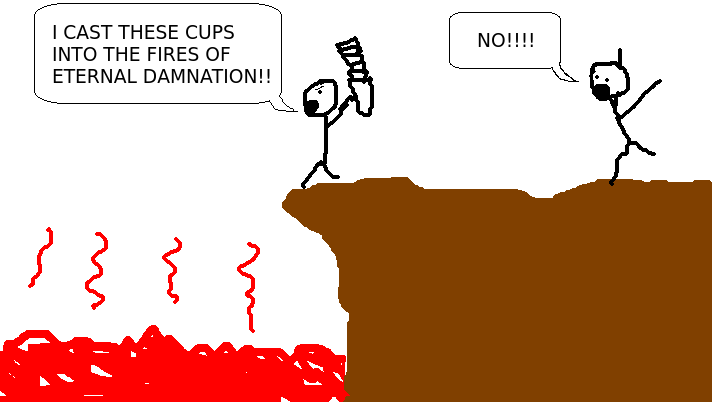 If a cup has been hit, the corresponding element changes from 0 to 1. So, there are actually two arrays that get passed to the function genTone(). For the MIDI functions, I reused the code written by Rick Winscot (who extended off of Nathan Seidle’s code he wrote for the Music Shield). You can find his code here. I remember there was a contest on Instructables that happened a while ago looking for the best use of coffee cups. Too bad I didn’t make this earlier. I have to admit, the winning entry of coffee cake would definitely have my vote! I’m thinking about extending this project a bit further and creating a larger version using maybe 25 or more cups. Of course, there will be some more hurdles to overcome. For now though, I’m just happy it worked. The folks at the coffee shop (who gave me the cups) seemed pretty excited when I showcased it to them.